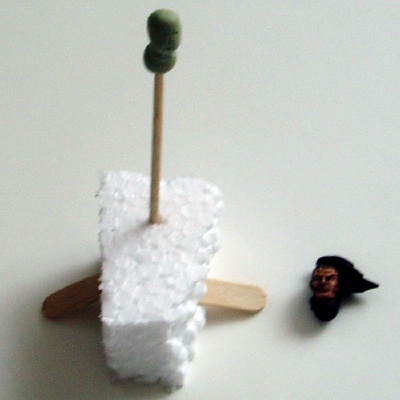 I could also then have this handy to check the scale as I sculpted. The first thing I did after mixing the milliput (Which smells disturbingly similar to my trainers) was to make a rough oval shape the same size as at the bottom of the head so that the finished article would glue into the body properly. 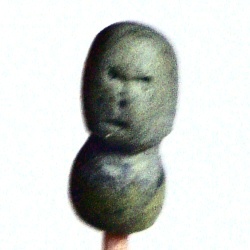 I placed this onto the cocktail stick in preparation for the main sculpt and allowed it to harden. 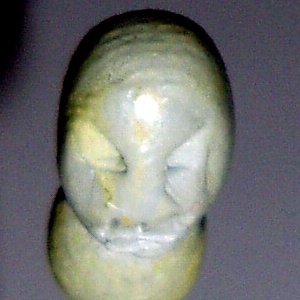 I then made a roughly oval shape a little smaller than the original head and allowed this to harden also. I made this version smaller as a framework (Like the “skull” of the figure) so that if I was unhappy with any of the further work I was doing I could just take it off and start again from this rough shape. original girly GW version for scale reference. of the sculpting tool) roughly where the eyes, nose and mouth would be. 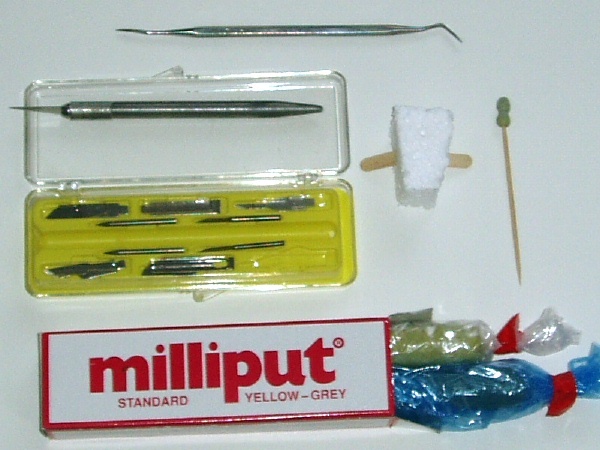 with my sculpting tool to make a depression for the eye sockets. I knew that I wanted several different changes in my head from the original; mainly that I wanted to change the girly ponytail to dreadlocks. And, forgive me, but this is just a personal opinion: I think dreads look a bit strange on a white man, so I wanted to try and give my head negroid characteristics. Once the skull had completely dried (And I think milliput seems a touch harder than green stuff) I started work on fleshing out the face. I started by rolling a small sausage of putty and placing it over the eye sockets and blending it the edges to make the brow. I also angled this slightly downwards to give a frown. I did try to add some furrows and lines, but decided to leave it for the time being as it was deforming the brow and I could always add them later. Next was the nose – which was another small sausage, but narrower slightly at one end – the narrower end would be the bridge of the nose and was blended very gently into the brow. I had to fiddle around about a bit trying to get the length, width and general shape right, but eventually reached something I thought looked about right. Again, I could’ve added mouth lines but left this for later. I also needed to add a bit of flesh to the top lip and beneath the nose after these layers had hardened. After finishing with the nose I compared the two heads, and realised my sculpt needed more of a chin, so I broke off a small blob (technical term #1) and squadged (Technical term #2) this onto the hardened skull’s chin. I had to work carefully to blend this in under the nose, and took a while to shape it right to the neck and the cheeks so that it didn’t appear too pointy and make him look like Jimmy Hill. I then decided to have a go at an ear – I was dreading this as I thought it would a complete nightmare, but I think it turned out ok. I broke off another small blob and made it roughly oval, but with it narrower at one end. I attached the ear following the jaw line to the side of the head in line with the eyes and made sure it looked right before blending it in. To make it appear more realistic I only blended it on the front side. I then used the flat edge of the sculpting tool to angle the ear so that it wasn’t vertical – which would’ve looked weird. I then used the pointy attachment for my knife to gently tap/stipple the curves inside the ear. I decided to do it like this rather than just dragging the tip as the ear was so small and still quite soft that I thought it would completely malform it. It ended up looking quite good (Although I know I would’ve done better with a photo of a real ear to work from rather than the original head). I took a step back and looked at the piece as a whole – yes, it was roughly the right size and everything seemed in proportion so far, but the head was wrong somehow – it didn’t seem connected to the neck properly. I used the last bit of mixed putty to spread onto the top and back of the head and used the sculpting tool and my finger to blend the lump in and make the head more of a round shape. 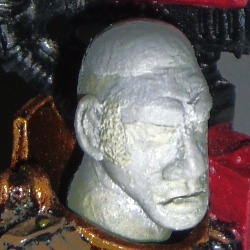 Unfortunately, as there was not quite enough putty, the result was an odd lump which looked like the inquisitor’s mum had tried to give him a Beatle’s haircut and it had all gone horribly wrong. Anyway – I compared the head again with the original, and there was still room to go over it later, as I didn’t want to mix up any more putty. ·	Most obviously, finish rounding the head into the correct shape! ·	Fill in the eye sockets and perhaps better define the cheekbones. ·	Add the lips and better define the upper jaw. ·	Add the figure’s left ear. I knew I was unlikely to be able to complete all the list this time again with a single lump of mixed putty, but I wanted to work slowly and thoroughly, rather than rush. I started with the top of the list and completed the rounding of the head, giving a much better transition from the neck. Maybe later I could add muscle definition to the neck – depending on how much would be visible once the head was glued in place. Next came the eye sockets. 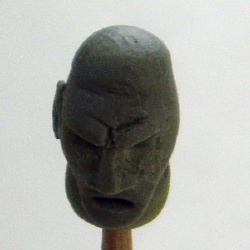 I placed two small balls in the centre of the depressions and smoothed the whole area in with the rest of the face. I then made two tiny ovals of putty, (which would be the actual eyeballs and eyelids) and placed these directly under the brow. I tried to give the brow a little prominence over the eyes, but found it hard to get both eyes exactly matched. 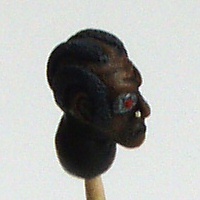 I decided to leave the figure’s left eye a little sunken and add more putty later. I defined the eye and socket very lightly with the very tip of my knife’s pointy bit. After the eyes, I needed to define the upper jaw, beneath the nose. It looked too flat, and needed to stick out a bit more, but not so much that it ended up looking ape-like! I placed a small sausage beneath the nose and blended in the sides into the cheeks. It then took a considerable amount of time to get the right shape without mouth getting covered up or making him look like he was doing a bad Elvis impression (uh huh huh). 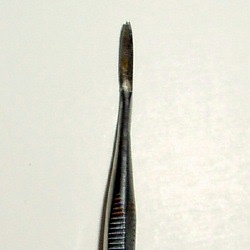 Later – when this piece was almost dry, I used the angled tip of a cocktail stick to add the depression directly under your nose (I forget the Anatomical name). Then came the difficult task of adding a bottom lip. This was made all the worse by being in such close proximity to the still-drying upper lip/jaw, and I could have done it later but I wanted to try and get it done now. I rolled and extremely thin sausage and cut it slightly longer than I wanted the lip to be (As the ends would be blended in). I then added it, and fortunately it seemed the right size. I rolled the blob left into a sausage with one end slightly thinner and placed the thinner end at the top, in front of the figure’s right ear. As it was the last piece, I didn’t worry about the thickness and left the piece quite fat, only blending it properly at the top as this would later likely go underneath the dreadlocks. I then used the pointy bit again to stipple on some texture. As this was all drying I decided to see how the head would actually look on the body, so removed it carefully from the cocktail stick and gently blu-tacced it. 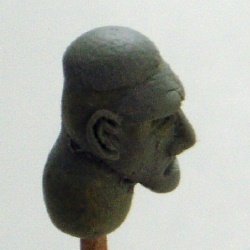 Once this was dry I mixed up a very small amount of putty as I wanted the ear dry before I started to make the hair. I also had to keep it line with the jaw line, but also the eyes and the ear on the other side. Again, it wasn’t as difficult to make as I’d feared. With the tiny bit of putty left, I rolled it up into a sphere and squashed it onto the figure’s right nostril to give him a nose stud. I also tried to make a small earring, but found it wasn’t sticking easily and kept dropping off. I figured if I really wanted one I could make it later and just use superglue. The next step was making the dreadlocks – I printed off some Bob Marley pictures to work from, but after making a few milliput dreadlocks I decided it would’ve been easier to do with green stuff. I also considered drilling into the head and using wire, but soon discounted that as it would’ve meant drilling loads of holes, and I wasn’t sure whether the whole head would crumble. So I played it safe and decided on a different style instead. 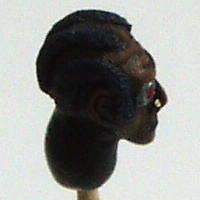 I decided that the inquisitor would have thick “cornrows”. These I made by making several thin sausages of putty and fixing them in parallel lines on the scalp. Once fixed securely, I pressed the entire surface with the bristles of an old toothbrush to give them appropriate texture. 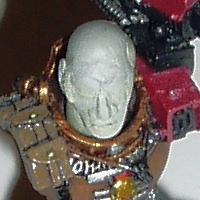 I still had a small amount of putty left, and it was then that I decided to give him a bionic eye – I decided I wanted it to look quite advanced and moulded to the inquisitor’s skull, so I pressed it over the right eye in a thin layer, straightening the lower edge. 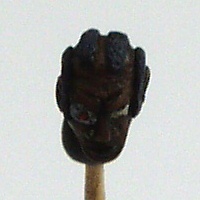 To show the eye piece I used the end of a propelling pencil to press a small circle. 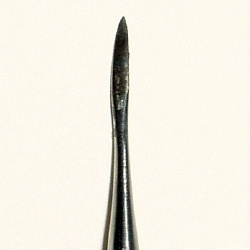 I then found a biro with a small end and took out the nib and ink to use the end as the rim of the eye piece. I then used a small pin to prick holes in the corners of the bionics to show tiny screws or rivets. head chaos black and gave it a very basic paint job. negroid? Never heard that term before. Great tutorial, I'm gonna give it shot tonight.